A plate heat exchanger serves wherever there is a transfer of thermal energy (heat) from one fluid to another. The advantage is that it can maintain the fluid temperature at a very low and stable level – depending on the temperature of the coolant. Plate heat exchangers consist of a stack of stamped heat exchanger plates which are either brazed together or bolted together in a frame with gaskets. Medium flows in the channels between the plates where the hot medium (which will be cooled) alternates with cold medium (which will be heated). The design of the plates induces the turbulent flow required for efficient heat transfer. The design and construction of the brazed plate heat exchanger is particularly compact and efficient. The heat transfer plates are of stainless steel and are brazed with copper as standard. For use with aggressive media, nickel braze can also be used. The copper-brazed plate heat exchanger is pressure resistant up to 30 bar, while nickel-brazed is resistant up to 10 bar. Special models are however also suitable for higher pressures. 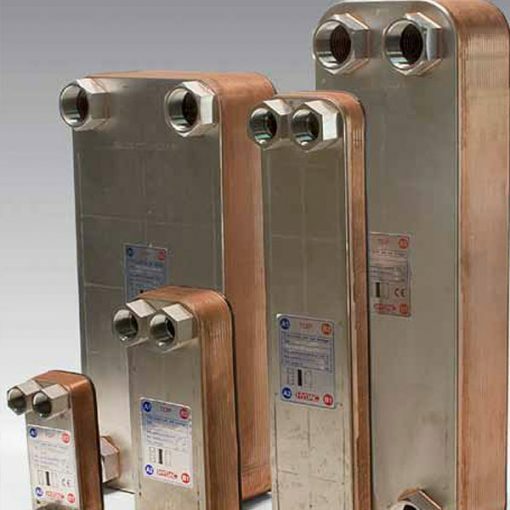 Gasketed plate heat exchangers are particularly suitable for large flows and high cooling capacities. The stack of heat transfer plates and gaskets is clamped together with bolts in a frame. This means that it is possible to dismantle the plate heat exchanger for cleaning and maintenance. Furthermore, it is possible to add more plates at a later date to achieve a higher capacity. For applications with seawater, it is also possible to supply a plate heat exchanger with titanium heat transfer plates. Various stamp designs can cater for heavily contaminated or high viscosity fluids to suit particular applications, or even if the temperature difference between the hot and cold medium is only minimal. Safety heat exchangers with double-walled plates serve in situations where the strict isolation of different media is mandatory. 3383908 HYDAC HEX S522-40-00/G1 1/2"
3383913 HYDAC HEX S522-80-00/G1 1/2"
3383914 HYDAC HEX S522-100-00/G1 1/2"
3383925 HYDAC HEX S522-120-00/G1 1/2"
3383926 HYDAC HEX S522-150-00/G1 1/2"
3457465 HYDAC HEX S722-20-00/G1 1/2"
3457473 HYDAC HEX S722-30-00/G1 1/2"
3457474 HYDAC HEX S722-40-00/G1 1/2"
3457486 HYDAC HEX S722-50-00/G1 1/2"
3457489 HYDAC HEX S722-60-00/G1 1/2"
3457490 HYDAC HEX S722-70-00/G1 1/2"
3457491 HYDAC HEX S722-80-00/G1 1/2"
3457493 HYDAC HEX S722-90-00/G1 1/2"
3457494 HYDAC HEX S722-100-00/G1 1/2"
3457495 HYDAC HEX S722-120-00/G1 1/2"
3457496 HYDAC HEX S722-150-00/G1 1/2"